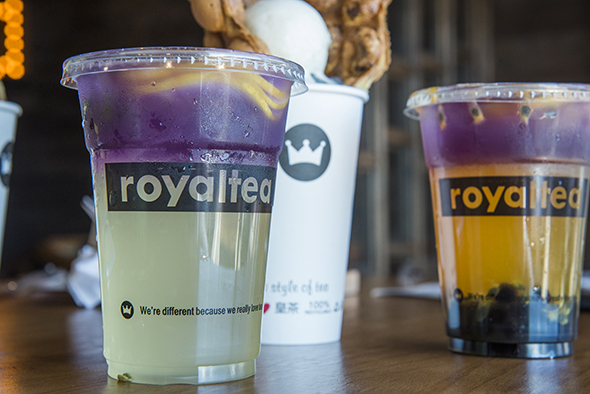 Royaltea is single-handedly responsible for those cute lightbulb milk tea pictures that may have crowded your Instagram feed. 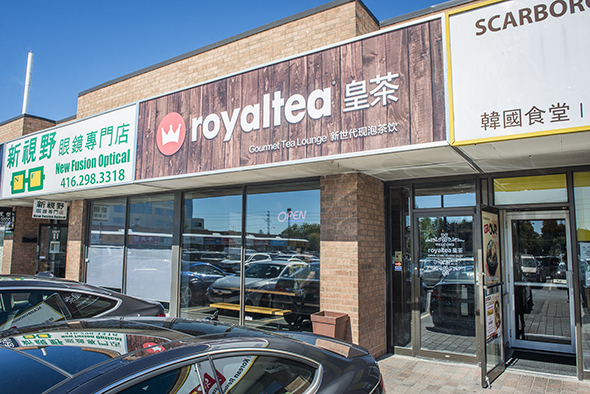 In contrast with many other bubble tea shops, Royaltea is a smaller chain, hailing from Jiangmen in China. 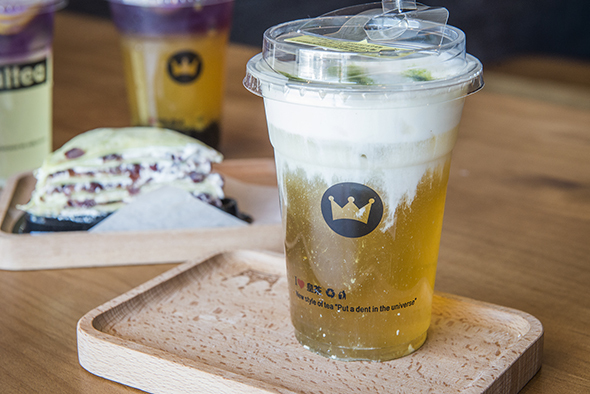 The chain positions itself somewhere between the fast casual concept of mainstream players like Chatime or Coco , and the boutique slightly-upscale experience offered at places like TenRen's Tea . The inside is an Instagrammer's dream. 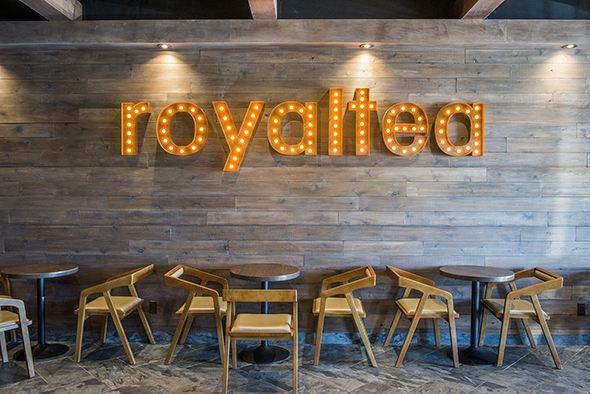 Dark wood walls provide a muted backdrop to the showbiz-style signage.. 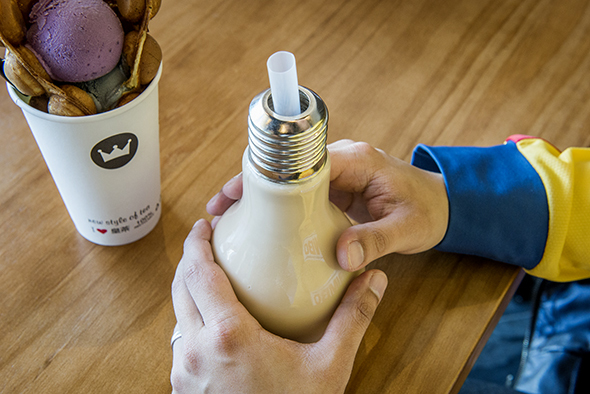 I try the famous Lightbulb Bubble Tea ($5.20). To be honest, while the tea is nice and smooth, there's nothing overly special other than the cute container. Better to opt for the Matcha version ($5.80) of the same drink as it provides a punch of matcha flavour that lifts up the drink. Royalties also makes a variety of multicoloured fruit teas such as the magnificently named Supernova Kumquat Lemonade ($5.70). I'm impressed by their use of fresh sliced kumquats, imported from Southeast Asia, which provides the drink with a light tartness that's refreshing. For those who prefer their colourful drinks sweeter, try the equally fanciful-sounding Spectrum Passion Fruit Bubble Tea ($5.70). Resplendent with a cacophony of crunchy passionfruit seeds, it's equal parts sweet and satisfying. Want something to munch? 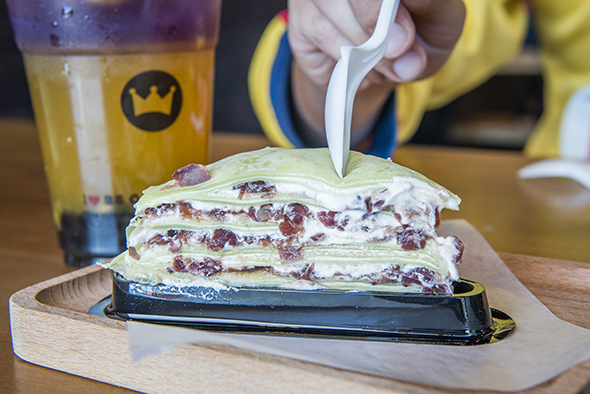 Make sure to try the Matcha Crepe Cake ($7.90). The cake is freshly made everyday from scratch, and is adorned with fresh cream and red beans. It's admittedly a bit pricey, but oh so worth it. If you're in the mood for something unusual, try the Osmanthus Oolong with Durian Mousse ($5.80). The beverage is to be drunk sans straw, while tilting the cup 45 degrees to ensure that your tastebuds get a taste of both the thick foam and the drink underneath. The mousse, made from a combination of cheese, milk, fresh cream and fresh blended durian, is definitely an acquired taste. It's salty, rich, with that classic durian smell that you either love or hate. Mixed in with a refreshing osmanthus oolong tea, it's a lovely, if unusual marriage. 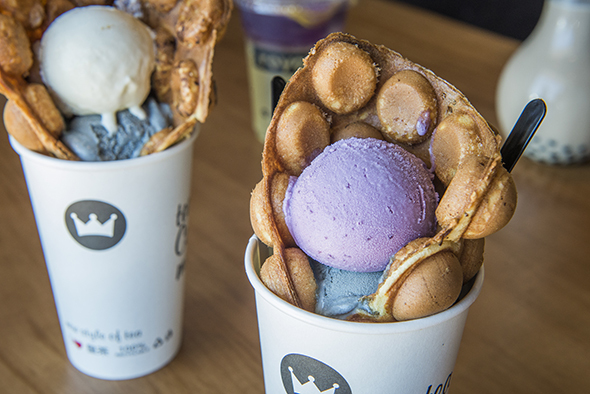 And for those with a big appetite, get the Chocolate Bubble Waffle and Ice Cream ($6). I try the vanilla and black sesame flavour, along with a helping of ube and black sesame ice cream, just to make sure I'm not missing out. The waffles are sweet and rich - a definite must-order.